Oct. 5: 9:30 a.m. – Noon | 1:30 – 4:30 p.m.
Nov. 2: 9:30 a.m. – Noon | 1:30 – 4:30 p.m. 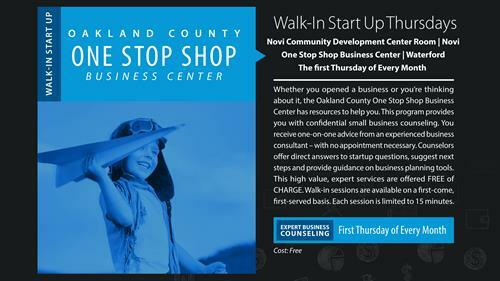 Whether you opened a business or you’re thinking about it, the Oakland County One Stop Shop Business Center has resources to help you. We can provide you with confidential small business counseling. You receive one-on-one advice from an experienced business consultant – with no appointment necessary. Consultants offer direct answers to your questions about startups, suggest next steps and provide guidance on business planning tools. These high value services are offered at no charge to you. Walk-in sessions are available on a first-come, first-served basis. Each session is limited to 15 minutes.